Topic: How long has Ridley held this notion of who the Space Jockey really is? So now that some time has passed and a lot of the implications of Prometheus have been digested, a question occurred to me. I'm not sure if theis was ever really delved into. It's really a two-part question..
1. Just how long has Ridley Scott considered that the Space Jockey in Alien is really an engineer; a creature which is "us" and created us? 2. While we're dealing with that, how long has Ridley Scott held that the aliens were a creation of a human-built android? I think that these questions are only as profound as their real answers. If it was Ridley Scott's intent all along, since the late 70's, that the Space Jockey was an Engineer who created us, then the story of Prometheus has merit and is true onto itself. If it is a pipe dream of his originating somewhere around 2008, and completely upending his original intentions, then it begs the question about what that thing in the chair really was intended to be. The second question is, well... secondary. We do have that old Giger painting which shows the guy in the space-suit getting impregnated. It looks a bit like an Engineer. Also, Ridley was but one person in the crew of creatives who came up with the Alien mythos. Perhaps Dan O'Bannon had a different vision for who the Space Jockeys were? I am curious about how well the notion of the Space Jockey was fleshed out before it became the Engineer, and if it was intended to be an Engineer all along. With all the interviews which took place, does anyone have any insights? O'Bannon originally envisioned the Aliens as a civilised, learned and long-lived race one they got over their adolescent blood lust. 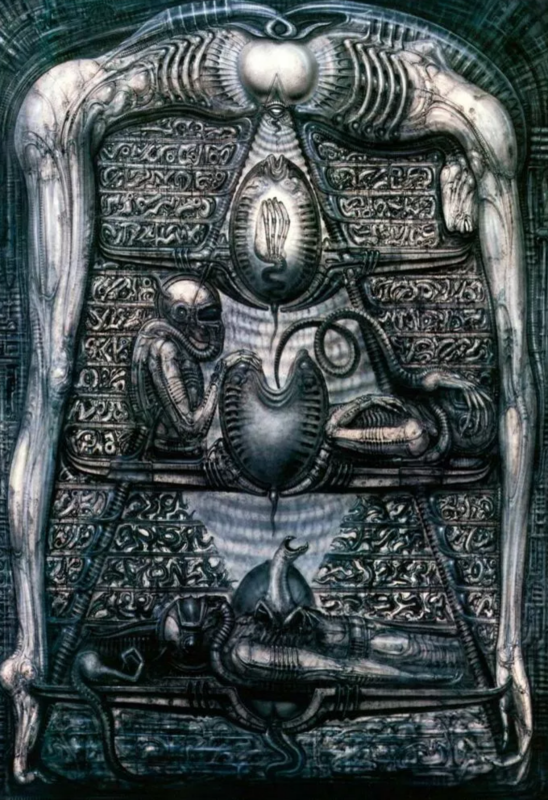 The beings in Giger's mural weren't intended to be Space Jockies (despite some similarity). Ridley's ideas about reinterpreting the Jockies as Engineers and having David create them would've come from the development of Prometheus and Covenant I imagine. He never mentioned such ideas prior to that in interviews or commentaries to the best of my knowledge. Valaquen would be the expert though. I'm fairly certain I read some BTS stuf once (maybe the Cinefantastique issue I had on the making of Alien '79), in which there was a description of Scott's first reaction to the completed Alien head. At that time, the plastic dome was a lot more clear and transparent that we know it today. If I remember this correctly, (and I admit to reaching into the darkest recesses of my memory for this), Scott had some reservations about the human skull being so obvious, so he got them to overspray some diffuse paint along the bottom edge to help disguise it. I've also heard Scott describe himself as a logical thinker(as in, things in his movies have to make sense), so it could be that right from the very inception of the alien's head design (Giger's painting "Necronom IV") Scott had been puzzling over the skull, trying to rationalize a reason for human anatomy to feature in an alien species. Perhaps this was the starting point for what was to become Prometheus? For my part, I used to wonder about the possible genesis behind a hybrid biological - machine creature. There has been some fan speculation about David incorporating features of his own body into the next generation of xeno (with the assistance of the black goo). I guess this would be one explanation. Scott came up with the "DNA" reflex explanation in '78, '79 before Alien 3 made it a thing. He said it looks like a person cos it came out of a person, and that if it had got the cat it would've looked like the cat. 2. Ridley Scott changed his mind from the Engineers creating the Alien to David creating the Alien, and he's right- out of those two options an A.I that's essentially "Other" to begin with, creating the Alien is far more appropriate than what's essentially space humans. As for Ridley Scott's original ideas on who the SJ was and where the Alien came from, I don't know about the former but I imagine in the eighties regarding the latter he would've said; Hell. Scott was talking about, 'what if the big skeleton in the chair was actually a suit' a good two or three years before Prometheus went into production. I imagine he'd been mulling it over for years - when he had time to consider why other director's had avoided it, but whether the original plan was for a humanoid Engineer - who knows? It's also a logical progression: The Engineers created us, we created David and David created the Xenomorph. Well it cleary is a kind of suit when you do look at it and think of it like a Space man. I don't think it was every meant to be a humanoid inside though. Also what Sil said, it was always the Alien took on the hosts features. Most likely reason - Possibly wanted to explore Alien/human story's and use the Alien films to do it. Struck gold on Fassbender and seen potential in making him the baddie. I mean he's always had pretty crazy ideas, wasn't it him that had a version of Alien where it talks in Ripleys voice and broadcasts a message? (this mural was supposed to be in the egg silo in Alien but I think it got cut because of the budget). Looks like a humanoid in a suit. Looks the same except the head's bigger, looks less humanand more alien. I heard that Ridley wanted to end ALIEN this way, it killed Ripley then did that, but don't have a source. I think that idea might have been inspired by a Lovecraft short story. I know it's not the same but it's certainly similar imo. Scott was talking about, 'what if the big skeleton in the chair was actually a suit' a good two or three years before Prometheus went into production. I'm sure this is correct. I remember Scott declaring at some point prior to 'PROMETHEUS', "Maybe it's a suit." For the life of me, I can't recall where I heard it. Maybe it's just another case of 'Mandella Effect'; but then again... maybe not. I'm pretty sure he did say it sometime well before the movie was announced. That's a long time ago, now. Maybe a decade. There's variations on the Alien delivering dialogue at the end of the movie. Some sources say it mimicked Ripley; others say it was to mimic Dallas. It certainly had plenty of time on its own with Dallas while it had him fastened to a wall. Hell. That's a creepy thought, while Dallas was being eggmorphed, it was constantly learning from him, including how to talk. Doubtful, or else it would've used a voice to lure Ripley, and then it's cliche. But the idea of learning the stuff is frightening. I imagine it stabbing him with a long and pointed finger to make him scream, then imitating the scream along with him. Well off key at first, but perfecting it within a few seconds. Probing the wound to keep him screaming, until it's identical. Two forms screaming in the dark, but one voice. Face to face in the black. Hearing his own voice spouted back at him from his tormentor. It climbs down and slithers away, mimicking his words. A hissing chorus of names and things it doesn't need to understand. It was merely curious. It dashes up a shaft in the distance, and leaves the secretion to its work. Very Annihilation. That film did this to good effect.